Good communication is essential for the success of any kind of IT project. Because as a software engineer, more often than not, you will have to work on a team. Building great software requires great teamwork. Communicating well can save you time, money, and effort. It also signifies respect for one another’s time and effort on the team. Many of the projects that fail come from the lack of communication or simply bad communication. It may be especially difficult when the team members are working remotely and come from different backgrounds. Online collaboration is the beauty of technological advancement, but it can easily be lost when communication breaks down. The good thing though is that if you follow a couple of guidelines and utilize some communication tools out there, you will be able to communicate more effectively on your team, thus increasing your team’s productivity. It’s important to have good descriptive heading or title when you are committing an issue on GitHub or when you are sending out an email. You want to let everyone on the team know in a glance what that particular Github issue or email contains, so that each member can prioritise it or find details later on when they need it. A bad GitHub issue would be for example “Something is wrong with the user form”. The wording is abstract and there is no way to know what the specific problem is. It would be much easier for others to understand the problem and engage with, if the title was something more specific and concrete, such as “The form doesn’t send an email notification when a user is not an admin”. Team members would then immediately know what the problem is and will be able to solve the problem more efficiently. You also don’t want to hide important information in the title. Don’t send out an email with the subject line “Social event next week” and mention an important meeting scheduled that day. You want to put them in separate emails, and definitely include the topic in the title, such as “Important: Meeting tomorrow”. That way you wouldn’t have to miss out on anything that needs your immediate attention. Make sure that your titles reflect what you intend to convey in the content body. Especially if you have a large number of people on the team, it is not necessary to involve every single person on every topic. It’s important to let everyone know what’s going on, but there are times when it’s better if only relevant people are included in the discussion. When there are too many irrelevant things being discussed online, it can easily clog up the platform, making it difficult for people to see where they need to be actively involved. Some ways to tackle this is to use separate channels (for example on Slack) to discuss specific topics, or tag people who are directly involved in the process. Using Emojis are a great way of expressing things in a concise and positive manner. Plain text can seem harsh at times, and can leave a bad impression on the receiving end. In order to avoid this kind miscommunication and keep things upbeat, positive Emojis are really useful in the conversation. Use them liberally! Don’t try to squeeze in different information in one Github Issue or on one task management card. They are designed to indicate one topic, no more. It may be tempting to add in bits of other information, but be true to what your headline or title says. Breaking down information and making it digestible to one topic per subject would make it easier for people to sort out tasks and be sure that each one is completed. Remember that your opinions are merely opinions, and not always the right decision for the team. Try to phrase your objections or opinions into a question or suggestion, such as “What do you think about…. ?”, “Consider using…”. This could help create a healthy discussion and avoid team members having to go on defensive mode. Discuss the tradeoffs, and come to an agreement quickly by phrasing things in a way that does not come of as a demand. Good online communication skills is one of the most valuable soft skills for engineers to have. The bottom line though is to be always respectful and mindful of others. Ultimately, you want to have a positive atmosphere among the team and an open environment where everyone can give one other feedback. The ability to work cohesively as a team even if you aren’t sitting in the same room is a huge determining factor of whether the project fails or succeeds. 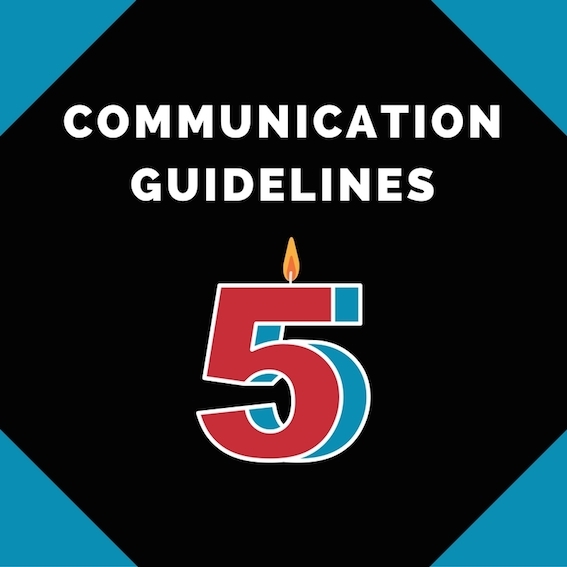 Follow these 5 tips today, and create a culture of good communication in your team or company!